Could York be England's most Christmassy City? The images and sounds of the Middle Ages - in the imaginary, Romantic version at any rate - beautifully lend themselves to the festive sparkle of the holiday season. Perhaps that is why York which, despite its Roman and Viking origins is still the most Medieval of English cities, can turn itself into such a Christmassy place. 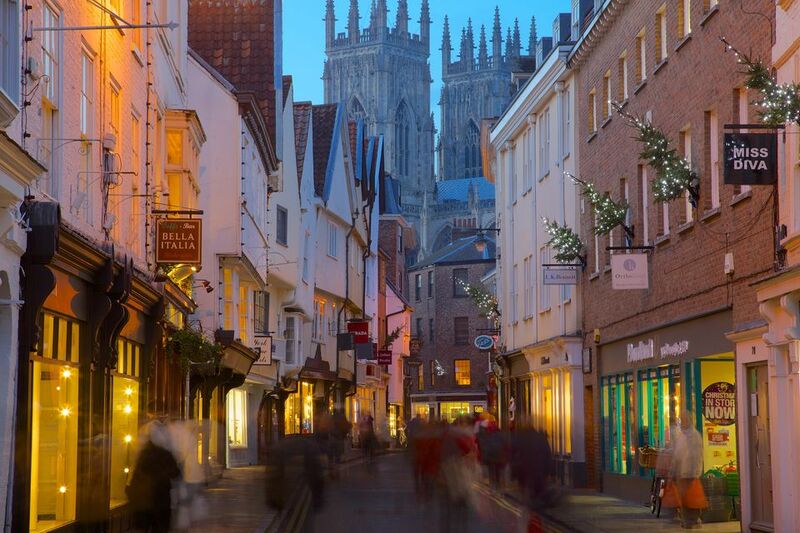 From late November onward, within the walls of York and overlooked by Northern Europe's largest Medieval Gothic Cathedral, this is England's "Christmas Central" . St. Nicholas Fayre - It starts with a festive first night that sees the city's holiday lights lit amid music, mulled wine and entertainment and lasts through to December 23. Stalls throughout are open for business from 10.a.m.to 6 p.m. Sunday through Wednesday and to 8 p.m. Thursday through Saturday. More than 100 Scandinavian-style stalls line Parliament Street, St Sampson’s Square and The Judge’s Lodging. At the Judge's Lodging, a Small Business Christmas Fair features handmade items by artisans and crafts people. Look for gifts on Coppergate and food and drink along the Shambles. The York Ice Trail - Moves to a new date for the 2018/2019 holiday season, extending the festive season to February 2, 2019. At least 50 imaginative ice sculptures sparkle all over the city center and surrounding streets, competing for prizes and promising lots of surprises. And for 2019, you can follow their facebook events page to see what's happening and get sneak previews. Check out a video of the 2016 carvings and fun. York's Living Advent Calendar - From December 1 to 25 a new Advent window, a different festive display, will be unveiled in a different shop window around the city. There are competitions for the best one. Yorkshire Winter Wonderland - From November 17 to January 6, Winter Wonderland at the York Designer Outlet, has the North of England's biggest ice rink plus a vintage fun fair and all the usual Christmas food and drink goodies. Some of the funfair rides date from as early as 1933. And in the 2018 - 2019 season there will be new food and drinks to try in the Papa Hütte, an alpine-themed, apres-skate café overlooking the ice rink, Catch up on designer shopping averaging 60% off and then relax overlooking the skaters' waltz. Advance booking on their website is a good idea. Edwardian Christmas is once again the theme at the historic Treasurer's House. The National Trust is decorating the house in the style of it's last owner, Frank Green, who re-imagined and rebuilt the house. It's open Thursdays through Sundays between November 15 and December 16. Medieval Christmas Traditions - Lost medieval Christmas traditions are shared at the Barley Hall in the city center, from 10 a.m. to 4 p.m. November 17 to January 5. Potions, charms and magic spells were all part of holiday festivities in the Middle Ages. The Christmas Early Music Festival - York is home of the National Centre for Early Music, within the city walls. The festival, at the beginning of December (in 2018 December 8 to 15,), fills several churches, and the Chapter House of York Minster, with Medieval and Baroque music. Tickets were already on sale by mid October 2018 and the festival is always sold out. So if you are going to be in York for Christmas 2018, check the schedule and book. The Minster Family Carol Concert - Listening, and singing carols in York's sublime Cathedral is one of the highlights of York's Advent season. There is an admission charge for this event. Due to its popularity, there are two concerts - in 2017 on December 13 and 14. Tickets go on sale in late September so don't delay. Check the minster website for exact times and how to buy tickets. They really do go all our for Christmas in York. Fine even more events - page after page of them - on the Visit York Christmas events pages and check out York at Christmas 2018 for a comprehensive guide to restaurants, special events, performances, parties and music with a holiday twist.